First published February, 20, 2016 on Networked Politics, my column on The Conversation. The first two stops in the travelling show called the Next American President did not lack entertainment. There were four different winners and plenty to talk about: some of the candidates cried foul, while others seemed ready to explode but didn’t; a few insignificant names dropped out from the race, while at least one frontrunner started doubting her strategy. The margins were quite slim in Iowa between leaders and runners-up, but unexpectedly wide in New Hampshire, were the underdog Bernie Sanders showed Hillary Clinton their virtual tie a week earlier was not a fluke after all. After his humbling defeat in Iowa, the controversial businessman Donald Trump shushed his rivals in New Hampshire with a mighty roar. Next in line, in a few hours, are Nevada (for the Democrats) and South Carolina (for the Republicans). The latest polls indicate once again a close race between Clinton and Sanders and another wide margin victory for Trump. The road to the nomination is still long but many already wonder whether the old maverick Bernie and the unpredictable Trump can really make it all the way to the final bout in November. Whatever the results are on Saturday night, or later next week when the two parties will swap states, it is very unlikely the picture will become any clearer. To have a better idea of who is likely to win the nomination we probably must wait until Super Tuesday (March 1), when 13 states will be decided simultaneously. For the time being, final predictions fall within the dubious dominion of divination. The lack of clarity about what is driving the success of some candidates over others makes the confusion about the probable nominees even bigger. 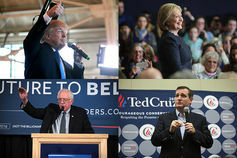 Beside the candidates’ platforms, in fact, is not yet at all clear what are the decisive elements in these early stages of the nomination race. Has the pedigree of candidates been enough for winning undecided voters? Or has it been more about the aura circling their names? Perhaps some of the candidates’ inclination for theatrics has helped tilt the balance between winners and losers? Or has it been all along – and possibly will it be until the end – a two-horse race: corporate power vs. networked citizens? After all, two of the main contenders in this race are a self-made billionaire (Trump) who considers his wealth an unequivocal sign of his own greatness, and a self-proclaimed democratic socialist (Sanders) who has declared war on corporate money and understands well the value of grassroots support. The dynamics of public choice in electoral politics are quite complex. A candidate’s pedigree (what she/he has done, their experience, their past) is always important, especially in the early stages of a campaign, when it helps to attract support and media coverage. It is not by chance that Hillary Clinton has been the unquestionable front-runner since she entered the race last April. But a candidate’s great experience and impeccable pedigree (as in Mrs Clinton’s case) are never bulletproof guarantee for final success. The last three presidents, Bill Clinton, George W. Bush, and Barack Obama were all less experienced than their opponents (in either the nomination race or in the general election, and in some case both) and yet they won. A similar line of argument can be employed to assess the influence of distinguished family names on voters. Market strategists always advise their clients that ‘brand recognition’ is a vital part of ‘brand loyalty’. ‘Recognition’ makes sure customers choose a particular brand over and over again. A ‘familiar name’ though is not sufficient to ensure victory, it is necessary because, as Barry Bartels puts it, ‘voters do not cast their ballots for candidates they don’t feel they know, at least superficially’. And yet that ‘familiar name’ can become a burden, or even worst, a matter of bitter contention. Consider Mrs Clinton and Jeb Bush current predicaments. Their family ties, coupled with their pedigrees, have been a formidable asset in attracting a large number of deep-pockets donors and endless hours of media attention. Nevertheless, a growing number of prospective voters (and certainly most of their opponents) consider the two unfit to govern because of their ‘family names’. ‘Bush’ and ‘Clinton’ in fact are recognizable symbols of highly contested political dynasties inextricably entangled with the corrupted establishment. The Bush family crest certainly helped George W in his first election, but it has proven quite a liability for his younger brother. Though lately, desperate for support in South Caroline, Jeb has publically embraced his big brother’s legacy, throughout most of this campaign he has steered clear from the tainted name Bush. He didn’t even use it in his campaign logo, just Jeb. To add insult to injury, Barbara, his outspoken mother, admitted some time ago ‘We’ve had enough Bushes’ in the White House. A similar line of argument could be used against Hillary Clinton. Theatrics always make a headline: the more outrageous, the better. 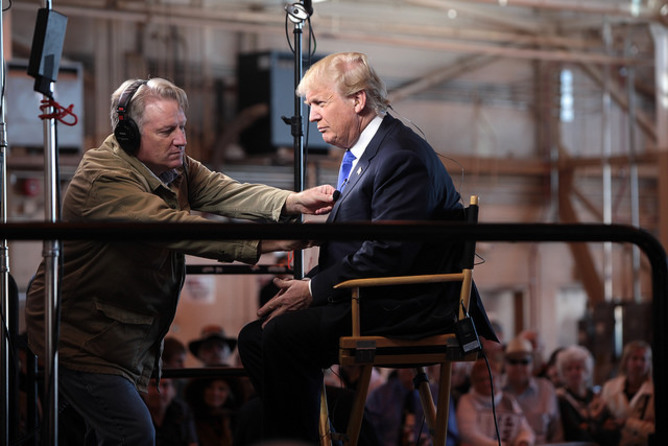 As Mark Chou and Michael Ondaatje have pointed out, Donald Trump is the champion of this approach: a ‘Trumpertantrum every now and then can do wonders for ratings’. Thanks to a media circus always hungry for this kind of entertainment, a ‘Trumpertantrum’ helps keep a candidate name in the media limelight ahead of others. What matters in this case, however, is not what it is said about the candidate, but is that people hear the candidate’s name over and over again. Yet theatrics and media performances alone are not enough to support a candidate through a long and tiring campaign, as the 2016 is shaping up to be. To win, a candidate needs much more than that. Money, more than anything, can keep a candidate afloat for a long time, despite plummeting polls and disappointing results. Money, also known as ‘the evil of all evil’ (at least according to Google Image search results) has always been an invaluable asset in American politics. And even more so since January 21, 2010, the day when the US Supreme Court’s controversial final ruling (5-4) in Citizens United v. Federal Election Commission put democracy up for sale. Rooted in the questionable notion that spending is a form of speech, hence protected by the First Amendment, the Court’s decision removed any existing limitation on the amount of money that can be donated to a Super-PAC(a Super Political Action Committee) to support a candidate’s election or a particular political agenda. As long as the spending is never coordinated with the candidate, there cannot be a risk of corruption, so the Court maintained. The ruling even permitted Super-PACs to accept money from donors (such as shell companies or 501©(4) organisations) which, by law, are not required to disclose their source of funding. The Court’s oversight makes nigh impossible to know who is really behind a Super PACs’ message. The 2012 Presidential campaign was the first run under Citizen United ruling. The Incumbent Barack Obama was challenged by Mitt Romney, a Republican millionaire whose ‘job was not to worry’ about the poor and the less fortunate; the very same people the pious millionairecold-heartedly dismissed as ‘those who don’t pay income tax’ but live off exploiting the Government’s welfare system. At the end Obama won and therefore, so the line goes, the critics were wrong: despite the Supreme Court, money didn’t succeed in buying out democracy. The argument is only half true. Money was, more than ever, a crucial factor in that election. Admittedly, at the end money didn’t influence the results as much as expected, but only because both candidates equalled each other out by raising the record-breaking sum of more than 1 billion dollar each: Obama’s $1.123 billion vs. Romney’s $1.019 billion. Romney received so much money in the last weeks of the campaign that when the results came in he still had plenty of funds left unspent. 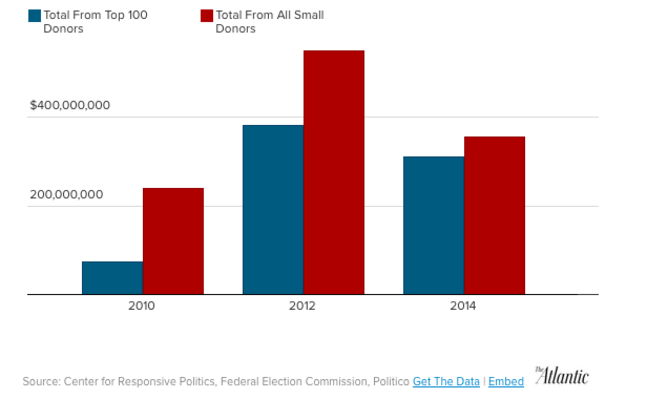 During that election campaign large single donations were on the rise against those of small-donors. The rich and powerful, especially on the Republican side, tried very hard to tilt the balance toward their chosen candidate. The casino billionaire Sheldon Adelson alone, reportedly, spent $150 million dollar against Obama. The 2012 records-setting race will be soon overshadowed by the ongoing campaign. The 2016 battle for the US Presidency will go down in history as the most expensive election of all time. Estimates report a final bill close to $10 billion with the last two candidates predicted to spend about $2 billion each, twice as much as in 2012. Of this staggering sum about half would be spent on TV advertisements. The impact of Super PACs seems already evident: rich elites, more than small donors, will determine who will win the race (at least the fundraising battle). So far candidates’ committees have amassed $438 million, but Super PACs are not far behind: $346 million. Last October The New York Times reported that, in a country of nearly 320 million people, ‘just 158 families’ (mostly republicans ‘overwhelmingly white, rich, older and male’) had contributed about half of all funds raised to win the right to sit in the Oval Office. The 2012 records-setting race will be soon overshadowed by the ongoing campaign. The NY Times’ list however doesn’t include the conservative billionaires Charles G. and David H. Koch, whose network of about 450 donors is poised to raise between $250-$300 million for electoral politics in 2016. Admittedly, to this day the two brothers haven’t yet made a mark on the current race. Apparently they still haven’t found a Republican candidate they are happy with, despite auditioning most of the wannabe-nominees last July at their Freedom Partners’ network exclusive annual conference, which the press quickly dubbed the Koch Primary. If the two brothers finally find their perfect candidate, they will certainly make him a very happy man (no woman is left in the Republican race after New Hampshire). If this gloom scenario becomes real and the ‘selected’ candidate wins, how much leverage will the Koch family and all the others major donors of his campaign have on the new President’s future decisions? A possible (rather grim) answer to that question can be found in the pages of a 2014 study published in the American Political Science Association. Martin Gilens and Benjamin Page’s research confirmed what most analysts already suspected: wealth has considerable leverage in US politics. The study showed that ‘a proposed policy change with low support among economically elite Americans (one-out-of-five in favour)’ has less chance to be adopted (only about 18% of the time), against 45% when that policy can count on ‘high support (four-out-of-five in favour)’ of the elite. 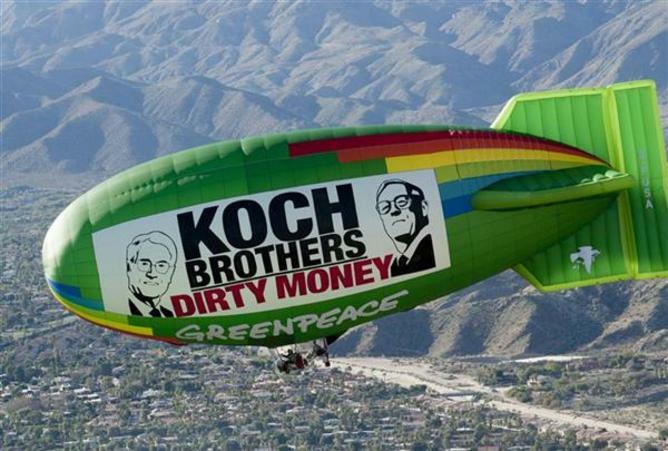 Will the Koch brothers and the other 158 families succeed in ‘buying’ the election come next November? Well it is, at this stage of the race, the billion-dollar question. But if we look at Iowa and New Hampshire, however, did money really count? Jeb Bush and Hillary Clinton have amassed more funds than any of the other candidates. The Former Madame Secretary of State has raised so far about $163 million. Nearly $90 million of Clinton’s funds (78% of the total), comes from large individual donations, that is, a donation between $200 and $2700 dollar; and almost $50 million comes from outside groups, the Super PACs blessed by the 2010 Supreme Court’s ruling on Citizen United. Jeb Bush, on the other hand, has accumulated over $150 million. Like Clinton, most of his funds come mainly from outside groups ($118 million) and from large individual donations ($29 million or 93% of all his individual donations). And yet, neither Clinton, nor Bush has succeeded in crushing their opponents. In fact, the reality for Bush looks even gloomier: he is lagging far behind. It is like his dollars belongs to a different currency: devalued and ineffective. Before the primaries even begun he had reportedly spent close to $50 million in ads, $10 million only in Iowa and yet he came out with just a handful of votes from the first caucus. Each vote cost him about $2800 in Iowa and $1150 in New Hampshire. Both times Jeb Bush’s name topped the list for the highest spender. On the other hand, curiously, Donald Trump, the Republican Party New Hampshire winner, spent a thrifty $40 per vote. But Trump’s apparent frugality should not mislead us. Though a shrewd businessman, Trump remains a billionaire willing to spend 1 billion dollar to win the White House. And so far he has personally ‘lent’ to his campaign 2/3 of the funds raised. Clinton, Bush and Trump tell us that money definitely counts, but how much leverage it can buy in this election is not yet entirely clear. Though some of the omens are not good, a ray of hope may come from a closer look at Bernie Sanders, the surprise winner of the New Hampshire Democratic Party primary. Sanders’ fundraising has been good, but far from impressive: his supporters have donated ‘only’ $75 million or about half as much as Clinton or Bush; of that sum, a meagre $31.000 came from outside groups (Super PACs). First impressions, however, can be deceptive. When we carefully unpack those numbers, we find out something much more interesting. 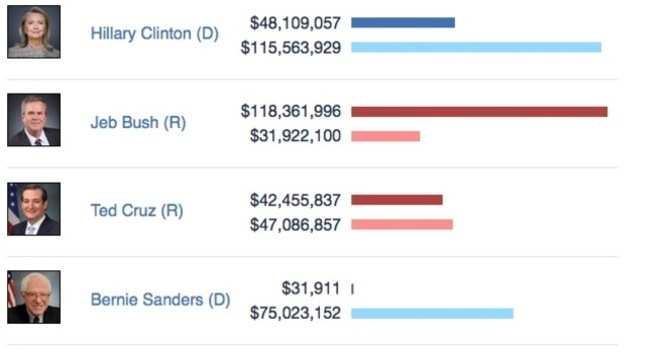 Contrary to his opponents, the bulk of Sanders’ funds (72%) is made of small individual donations ($200 or less). On average less than $30 for contribution. An insignificant 2.3% of Sanders’ total (about $1.7 million) comes ‘from maxed-out individual donors’, those who donated $2700 (649 of his army of 1.3 million contributors). In the case of Clinton and Bush, on the other hand, the numbers go up, respectively, 58% and 75%. What hides beneath these numbers is a simple but rather important hint about the current presidential race: for a candidate like Sanders, who has pledged to repeal Citizen United and end money’s influence in politics if elected President, it is not corporate gold that will decide whether he wins the nomination. 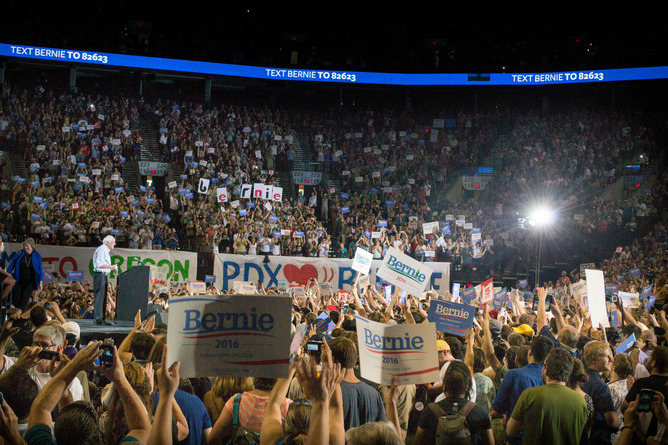 We live in a world in which politics is more than ever before the product of a wide range of interconnected spheres of influence, therefore to win an election, underdog candidates like Sanders must build their campaign aroundan army of networked citizens. 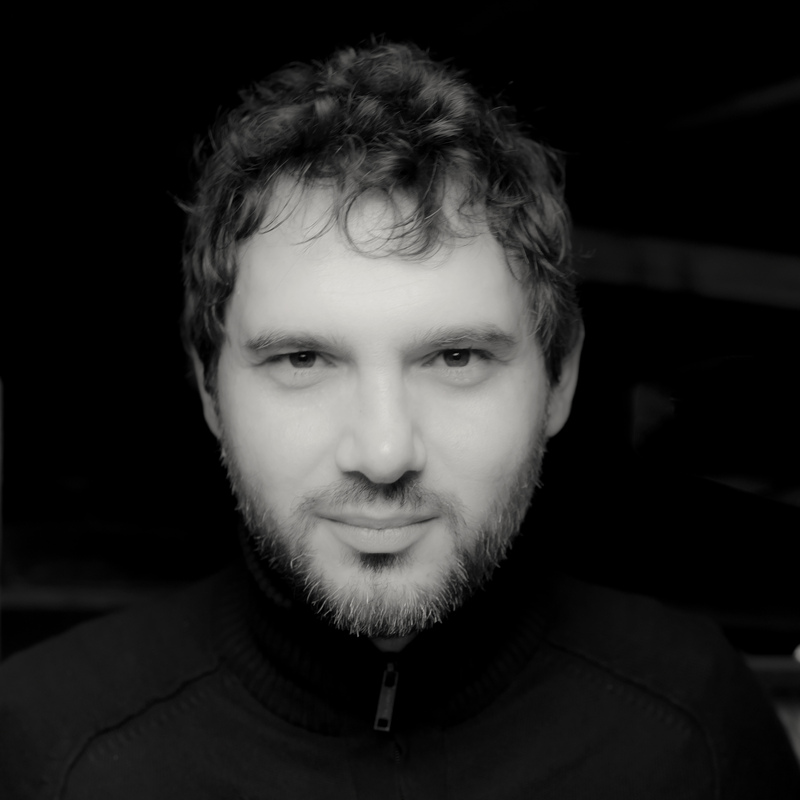 These are individuals who fully grasp the logic of connective action and the multidimensional nature of networked politics. In other words, they are fully aware of the much greater role citizens can (and must) play in a heavily-mediated political milieu; it is a role that goes far beyond the limited spectrum of elections. Networked citizens are not the embodiment of an empty ideal. They are in fact rather normal individuals who comfortably inhabit a life in which the lines between ‘online’ and ‘offline’ existence are happily blurred together. They are, potentially, always networked. They are at the same time door-to-door campaigners and bloggers, town hall meetings attendees and trigger-happy tweeters. They can be great time-wasters, spending hours on end watching trivial videos on Youtube. But at the same time they have the ability to quickly wake up and use digital media networks and devices such as smart phones to resist and challenge any form of hubris. Such ability makes them, potentially, vital drivers of political change, great allies of any underdog wannabe-president. Barack Obama, a former community organiser, was the first presidential candidate who capitalised fully on the political potentials of networked citizens. And he was handsomely rewarded for that. In 2008 Obama’s strategists used the Internet to establish a thriving grassroots movement of many millions of networked citizens whose impact on the election was unmatched, online and offline, by any of the other candidates’ campaign supporters. At the end, the numbers of the Obama’s campaign were impressive: more than $500 dollar million raised online, an e-mail list with over 13 million addresses. 7,000 different email messages sent out to supporters; 1 billion total emails sent; 1 million text-message subscribers. 3 or more text messages to every subscriber in a battleground state on Election Day. Over 2 million profiles on MyBarackObama.com. 400,000 blog posts written. 3 million calls made by volunteers through the campaign’s virtual phone bank during the final four days prior to the election. 70 thousand personal fundraisers on MyBO.com responsible for raising over $30 million dollars. 5 million supporters in other social networks, but also 35,000 volunteer groups and over 200,000 offline events often coordinated with limited cost via the Internet. 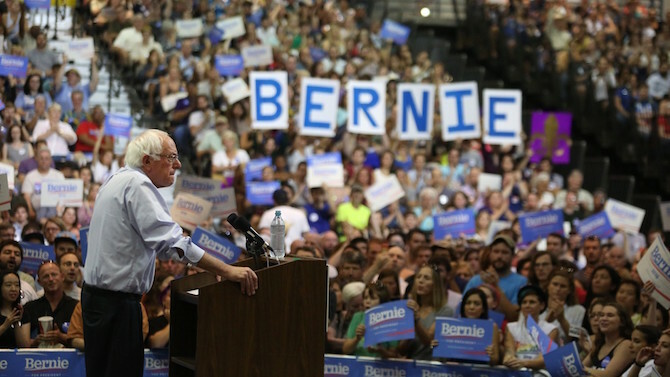 Bernie Sanders’ campaign seems to have borrowed quite a few tricks from Obama’s playbook. Sanders has already more than 1.3 million donors; he can count on a thriving Facebook following (he dominated the social network conversation in the days leading up to the Iowa Caucus – 75% vs 25% for Clinton). Since last Summer, thousands of people have turned up at his rallies; others have signed up to livestream his speeches to thousands of watch parties. And these trends are showing no sign of slowing down. After his victory in New Hampshire, Sanders’ campaign has managed to shatter its previous record by raising more than ‘$5.2 million’ in just over 18 hours (average donation: $34 dollar). If Sanders continues on this path he might have more than a slim chance to become Hillary Clinton’s worst nightmare: a re-run of the 2008 campaign, where she, the anointed favourite to win the Democratic Party nomination, lost to the ‘socialist’ underdog Obama. Six years after Citizen United, money counts more than ever in American politics. Pushed to its extreme, such view calls into question the whole idea of citizens’ freedom of choice: do people still have a meaningful role to play in this kind of democracy? Or all is left for them to do is to provide some form of phantom democratic legitimation to the two final candidates, whose names were picked by the rich and powerful? Given their ties with money and corporate power, in a final showdown between Hillary Clinton and Jeb Bush (or Marco Rubio or even Donald Trump) will there really be a difference between the two candidates? The numbers seem to tell us that without plenty of funds, no candidate can seriously hope to go all the way to the finish line. At first glance, the buying power of thousands of supporters can be easily outweighed by a Sheldon Adelson or Charles Koch, whose Super PACs or wide network of donors can help their chosen candidate weather any storm and perhaps be the last one standing when election day is over. It is an open question, at least until November. The future, for the time being, remains everything but certain. Yet, Bernie Sanders’ resounding victory in New Hampshire and his continuing surge in the latest polls in Nevada hints to the possibility that 2016 might still turn out to be a year full of surprises for American politics. In this year, not only people’s commitment, but also their ability to network might still make a difference. In all matters of public life, people’swillingness to be political can do wonders. This army of often dispersed networked citizens could very well become the cornerstone upon which someone like Sanders builds his unexpected success. It has happened before, not only in America with Obama, but also in Italy with Beppe Grillo and his Five Star Movement, and more recently in Spain with Pablo Iglesias and his Podemos. Whatever our political leanings are, we should all hope the trend continues, at least until next November. Even the most cynic among us might interpret the continuation of such trend as a victory for democracy: we’ll have some evidence that citizens’ heartfelt support is still worth more than shiploads of shining corporate gold (even in a democracy as deficient as present-day America). However, if what wins is money, then we better get ready to cheer for the new President of the United States of Kochs.